Just Shutters are your local shutter specialists. Husband and wife team Ken and Angela are delighted to offer the finest plantation shutters in Chester, Wirral, Ellesmere Port and the surrounding areas. Chester Shutters – Call us on 01244 567 890. Our expert knowledge and vast range of materials and finishes means we can create any look, but we also understand your home is an important reflection of you, and that listening to your ideas is the first important step in creating the perfect solution you will adore for years to come. Plantation shutters are internal window coverings sometimes known as colonial shutters or shutter blinds, they are superior to most other options, not only in looks and style, but also in terms of practicality and long lasting value. Furthermore, we are offer a lifetime guarantee with all of our products. And of course they are a simply gorgeous design statement…. our customers frequently tell us how much they love their shutters, click here to see the top 10 reasons for choosing plantation shutters as voted for by our customers. 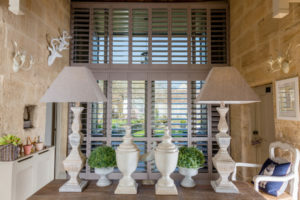 Just Shutters are a specialist company with one overall focus; bespoke interior plantation shutters. As such we offer the finest, broadest range of products in the UK. We are proud to be one of the most trusted shutter companies, with an outstanding reputation. – Furthermore we offer a lifetime guarantee on all our shutters – yes we are that confident in ourselves and our product. We are happy to arrange a home consultation, or simply answer any questions you may have. You may like to download our brochure or check out our shutter images for more inspiration and information before you book, please do look around, we hope to welcome you among our happy customers soon. The Just Shutters ethos has customer satisfaction at it’s heart, therefore we are incredibly proud of the positive feedback we receive. Visit our checkatrade profile where we have 1700+ reviews which as a result have given us an incredible 9.9/10 rating.